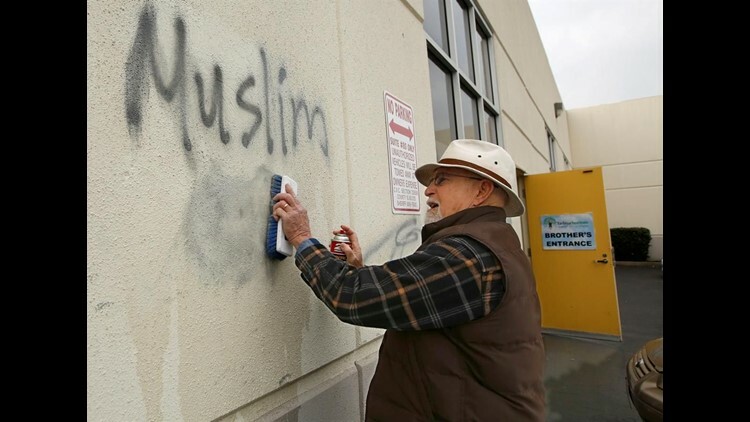 SACRAMENTO, Calif. (AP) — The number of hate crimes in California increased about 11 percent last year, the second consecutive double-digit increase, but the overall number still was a third lower total than a decade ago, the state's attorney general reported Monday. Blacks, Jews and gay men were among the most frequent targets. There were 931 such crimes reported statewide in 2016, nearly 100 more than in 2015. That equated to about one for every 42,000 Californians. By comparison, there were 1,426 hate crimes reported in 2007, when the state had about 3 million fewer people than the more than 39 million in 2016. More than half the crimes reported last year were based on the victim's race or ethnicity. Hate crimes involving a victim's sexual orientation increased about 10 percent, to 207 last year, with about three-quarters of those targeting gay men. Less than 20 percent were because of the victim's religion. Jews, not Muslims, were the most common targets even amid heated rhetoric by Donald Trump during the presidential campaign regarding potential terror threats from Muslims. There are no statewide statistics on hate crimes in California since Trump took office in January. "When someone commits a crime motivated by hate, it is not just an attack on one innocent person, but an attack on the entire state and our communities," Attorney General Xavier Becerra said in a statement. "Words matter, and discriminatory rhetoric does not make us stronger but divides us and puts the safety of our communities at risk." He noted that FBI reports show a nationwide increase in hate crimes. More than half of such crimes are not reported to police, he said, while pledging to work with law enforcement to prosecute those responsible. Racially motivated attacks spurred much of the overall increase last year. They increased more than 20 percent, from 428 in 2015 to 519 last year. Those targeting whites increased from 34 to 56; those against blacks from 231 to 251. The reports are submitted to the attorney general's office by California law enforcement agencies and district attorneys' offices. Nearly two-thirds of all the hate crimes reported last year were violent, while the rest were property crimes. About 40 percent of crimes categorized as violent involved intimidation and 30 percent simple assault. About a quarter were aggravated assaults. Ninety percent of the property crimes involved vandalism. More than 300 hate crime cases were forwarded to county prosecutors last year, and they filed charges in 220 of them. Of the cases completed by year's end, more than 80 percent resulted in convictions.